We were nominated by fellow blogger, projectrelish, for a seven-day photo challenge, so we will be posting one of our nature pictures every day for the next seven days. For our first post, we’ve decided to use a picture of a Betel Nut Palm Tree (Areca catechu) with its red ripe fruit from our trip to Punta Cana in the Dominican Republic. 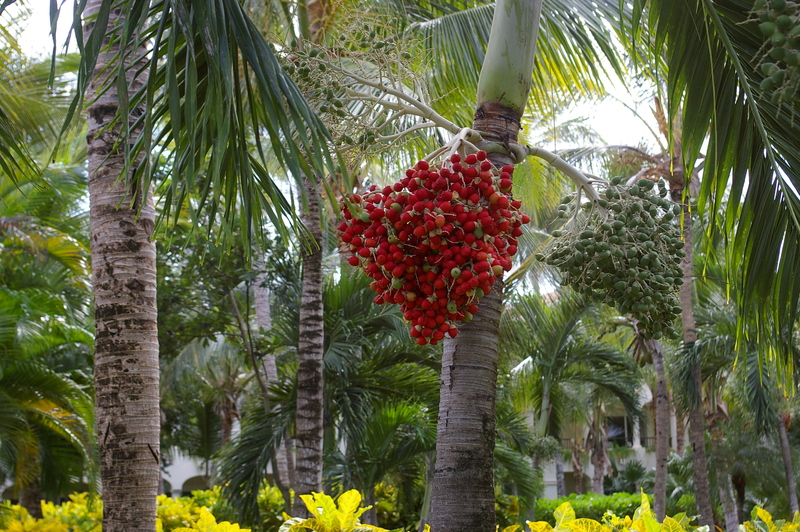 We took the picture of the fruit while we were walking through the resort, but it actually took us a while to find out what type of tree it was. The bright red fruit just jumped out against the lush green tropical fauna. Although it is called an areca nut, it is really a fruit and apparently in some parts of the world, the fruit is chewed along with a betel leaf. We’re not sure that it looked that appetizing, but it was definitely beautiful. Rules: Post one nature photo and nominate someone else for seven days. Nominating setmeravelles for the challenge, who has a wonderful site about travelling across Spain. This entry was posted in Photo Challenge and tagged dominican republic, nature, naturephotography, Photo Challenge, photochallenge, photography, sevendaynaturephotochallenge, travel. Bookmark the permalink. I’m going to have to get on this! 🙂 And lovely photo by the way! Does it have to be 7 days in a row? 🙂 I’ll post one tomorrow for sure. It is supposed to be every day for seven days.